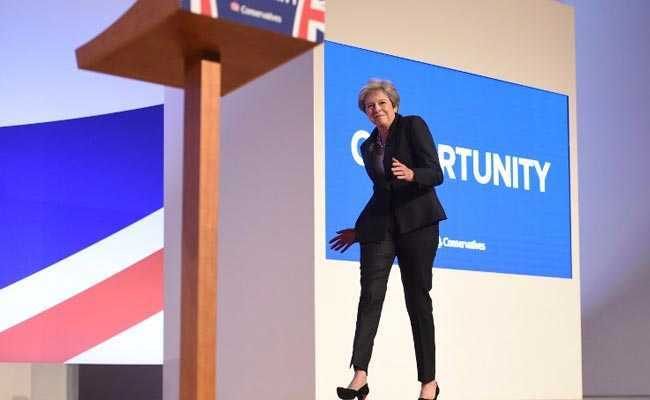 Gyrating awkwardly to the sounds of ABBA's disco hit "Dancing Queen", British Prime Minister Theresa May made an unusual stage entrance for a keynote speech on Wednesday. May, who captured headlines for her robotic dancing during a visit to Kenya in August, was under pressure to put on a good show at her Conservative Party's annual conference. Her rival Boris Johnson wowed grassroots members with a barnstorming speech on Tuesday and, at last year's conference, May lost her voice and spluttered her way through her address. Online reactions were less complimentary of May's moves. Labour MP Angela Rayner wrote: "I use to love the Dancing Queen by Abba #Cringe" accompanied with a sad emoji. Twitter user @JoeBlob 123 wrote: "I need the sick bucket". Another @tasmincrompton wrote: "We are laughing at you, not with you". Others came up with lyrics for May's version of the iconic song. "Oooh/ EU can dance/ Pound can dive/ Taking a chance with your lives," wrote James Felton, a comedy writer. Some also pointed out the irony of a prime minister aiming to deliver Brexit dancing to the sounds of a Swedish group. But unsurprisingly, Sweden's ambassador to Britain, Torbjorn Sohlstrom, lauded May's moves. "I can only say Bravo to @theresa_may for starting her conference speech with ABBA's Dancing Queen," he said in a tweet.